The messiest and arduous part of carpet cleaning is removing gum from your lovely carpets. Do you know there is a chain of polymers that make the nature of your favourite chewing gum elastic and sticky? The polymers are hydrophobic, that means they repel water and thus does not stick with your mouth that is laden with saliva. But it naturally sticks with many other objects that has no water, like carpets, shoes, furniture, paper, etc. Remove Gum From Carpets, without damaging the carpet is a tricky job and you need professional help for the same, if you do not choose to hire a carpet cleaning professionals to remove gum from your carpets you can obviously use their advice. 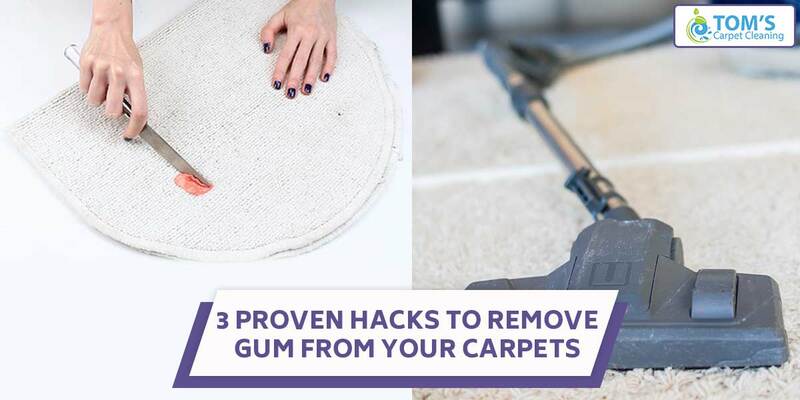 In this article, Toms Carpet cleaning professionals are have itemised hacks for you to remove gum from carpets. Good riddance! The polymers in the chewing gum have loose bonds and thus they are elastic. Ice helps reduce the temperature of the gum. This makes the molecules bond together with each other faster and becomes stiff. This hardened blob will now be easy to be removed. Step 4: Remove the majority of the gum with a butter knife carefully off the surface of the carpet. Step 5: Wet the surface that has little gum stuck to it. Step 6: Get a dry cloth and rub off the wet gum. Oil has gum softening and gum dissolving properties and thus it is a good thing to help you get rid of gum from carpets. Make sure you use an oil that has no colour and no odour. Step 1: Apply oil with a brush on the gum. Step 4: Use detergent and water solution to and cloth to wipe off the remains of gum and oil from the carpet. Ask for Methyl Salicylate, as out of all the commercial solvents that works the best. This chemical helps degenerate and dissolve the gum. Step1: Apply the chemical based solvent onto the gum with a brush, let it stay for 5-10 minutes. Step 2: Use a butter knife to scrape it afterwards. Step 3: Clean the residue after water and detergent solution in the cup. Step 4: Wipe it with the cloth. To know more on Carpet cleaning call Toms Carpet Cleaning Melbourne to get same-day, on-site services across Melbourne on 1300 068 194.